Bright red footprints, like they'd been painted in a playground, appeared on the steps that we were hurriedly climbing. Not every step, only some. Every second or third stair was marked by a print hastily left by whomever it was that had either caused this horror or, at the very least, discovered it. 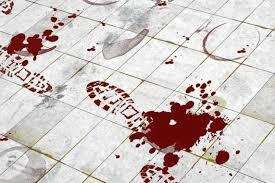 We would never know whose prints they were, but a clue had been left for the police to use in their hunt. Each mark, no more than half the sole of a shoe or a boot, was as red as the next, each as incriminating as the next, each as foreboding as the next. As we ascended three flights of stairs, the footprints descended at speed. The floor and the walls are awash with red; pools and clots and smears and streaks. And footprints. And in the middle of it all, she lies, barely breathing, barely conscious, barely alive. Two police officers search the house as we start to treat her. The scene is no better in the tiny bedroom or bathroom. She had tried to escape and was cornered, prevented from fleeing by the force of a knife, and by her lifeblood draining away. Eventually, she fell by the front door and there she lay, waiting, in a motionless race against time. It took time to get her out, as we stepped out of the sea of red, time she didn't have. We couldn't bandage each wound; they were too many, and the minutes too few. We could barely stem the bleeding, although, ominously, it seemed to be slowing of its own accord. Four pairs of hands carried her on the backboard down the stairs, following the footprints and leaving some more, but this time each step was marked. Prints of different sizes, different shapes, but each dipped in the same red paint. At the hospital, they're ready for her. Bags of fluids and blood hang at the ready the instant we set foot in the resuscitation room. Oxygen can already be heard hissing out of the tap. Nurses and doctors take over the treatment. Orders are barked, instructions carried out, messages relayed. She's still breathing, still conscious, still alive. Outside, as we start to clean up, the police are waiting for us. They want the prints from all our boots. One by one, each police officer who had entered the scene, each paramedic who took part in the call, steps somberly on and off shoe-shaped pieces of card. Each leaving a pair of gruesome footprints - the imprints that would rule them out of the investigation - but would leave a mark in their minds. Inside, in the meantime, as the footprints dry, she dies.